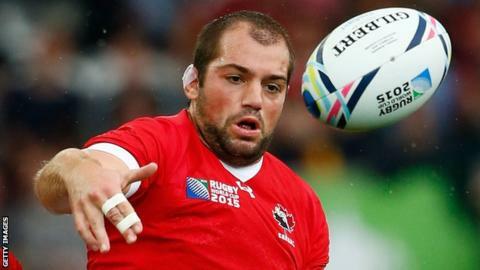 Cornish Pirates' Canadian World Cup players are getting up to speed after returning to the club, according to director of rugby Ian Davies. Brett Beukeboom and Matt Evans start for a second week when Pirates host Bristol, but Aaron Carpenter misses out after a head injury. "Matt's just got to learn how things have changed to the defensive systems and the attacking patterns. "But they're intelligent guys and they'll get into it very quickly I'd imagine," Davies added to BBC Radio Cornwall. Carpenter played in all four of Canada's losses in the pool stages of the World Cup while Evans and Beukeboom each started three matches. Meanwhile, Davies knows how difficult Saturday's clash with Championship leaders Bristol will be. Last season's beaten play-off finalists were on a 19-game winning streak when they lost 45-38 at the Pirates in February, and have in fact lost on their last six trips to Cornwall. "Bristol set the league on fire last year, this year they're chugging along quite nicely," said Davies. "They're still winning games and if any team in the Championship know that it's about peaking in May, not peaking now, they do."